Agrarian distress that has spread across states is a major issue that the Narendra Modi government has not been able to tackle. The last four years have seen massive protests by the farmers in Rajasthan, Maharashtra, Madhya Pradesh, Jharkhand, Karnataka with farmers marching from Haryana, Uttar Pradesh and Tamil Nadu to Delhi to press home their demands for loan waivers, and remunerative prices as per the Swaminathan Commission recommendations. Farmers have marched in the states, faced bullets, filled jails, staged sit-in’s with the struggle intensifying over the months. State governments have conceded some demands as in Maharashtra but not implemented these, used bullets as in Madhya Pradesh, and tried to break the farmers unity but without much success. Instead 200 kisan organisations have come together under the banner of the All India Kisan Sangharsh Coordination Committee, with the All India Kisan Sabha playing a major role in all this. The farmers anger is contributing to an anti-incumbency that is visible in the states going to the polls —in particular Rajasthan and Madhya Pradesh where the agrarian distress has been intense as has been the counter mobilisation— and this has clearly rung alarm bells in the BJP. Unable to meet the demands —or at least unwilling to— the focus of the ruling party at the centre has been to escalate the temple issue at Ayodhya. Even as the farmers prepare to march to Delhi in the thousands on November 29-30 for their demands, the right wing outfits have come together to organise dharma sabhas for the construction of the Ram temple at Ayodhya in a bid to whip up passions over religion. And eclipse the farmers unity with polarising and divisive sentiment. 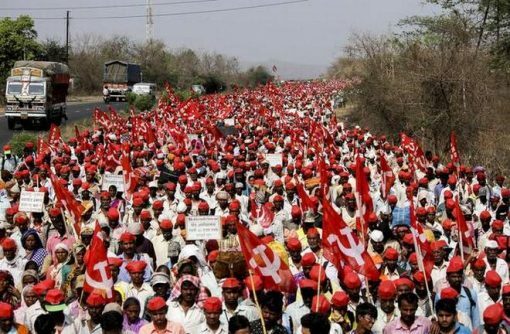 The All India Kisan Sabha has already warned against this effort maintaining that the “BJP and the Sangh parivar are seeking to divert attendion” as the government has failed to deliver on the promises made to the farmers. And that issues like Sabarimala and Ayodhya are being raised to “whip up communal frenzy.” This, as the farmer organisations have pointed out, is in sharp contrast to the visibale agrarian unity whee the farmers have come together —now backed by several Opposition parties— for the passage of two Kisan Mutli bill through Parliament. The Farmers’ Freedom From Indebtedness Bill, 2018 and The Farmers’ Right to Guaranteed Remunerative Minimum Support Prices for Agricultural Commodities Bill, 2018 to ensure liberation from debt and assured remunerative prices. These Bills have been introduced as Private Bills in the Parliament by K.K.Raghesh, MP and Joint Secretary of AIKS in Rajya Sabha and by Raju Shetti, MP from Maharashtra in the Lok Sabha. Significantly, just as a show of strength by the farmers in Rajasthan became a peoples movement, several organisations and citizens have extended support to the Kisan Mukti March to Delhi, collecting funds, preparing a massive cultural event, and mobilising civil society to embrace the farmers and their issues. The struggle —despite the participation of tens of thousands of farmers— has been peaceful, disciplined, and united. It is perhaps then in the fitness of things that the Delhi Declaration by the farmers will include an appeal to all to stay united, and defeat the divisive agenda of the right wing brigade.The counter show of strength at Ayodhya— with the Shiv Sena, Vishwa Hindu in the lead— is expected to be followed by a rally now in Delhi on December 9 to pave the way for the construction of the Ram temple at Ayodhya. And set the agenda for the Lok Sabha elections. Temple versus Livelihood.